I read Elembee on a regular basis for blogging tips and tricks; it is one of my go-to resources that I've been leaning heavily on recently. A few weeks ago, Lisa posted about turning Monday into a "My Day" using a spin on the French word for my, mon. I wish that I had the freedom to schedule my day like Mandy & Lisa both suggest, but unfortunately, classroom duty calls. 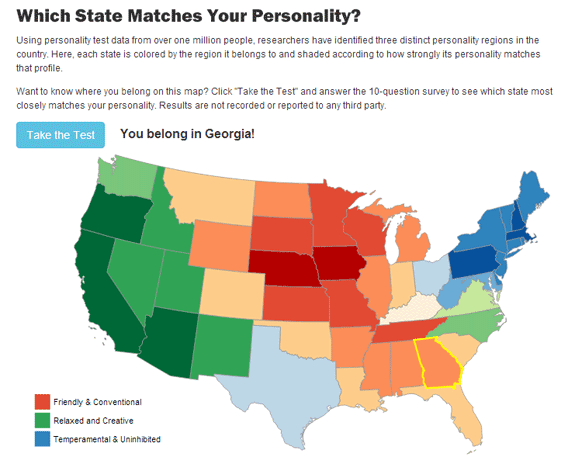 This quiz about your state personality was a lot of fun for me. I got Georgia which made my heart smile. Take the quiz yourself and comment below with your statehood personality! Loved loved loved watching this quick YouTube video about making someone's day brighter. In this case, the NYC subway drivers. When I'm stressed, even though it seems like I don't have any time at all, I like to sit down and read (away from the computer, remember?!). My book club has decided to take on How Dogs Love Us this month which discusses the science behind a dog's love for his/her human. So. Fascinating. Speaking of dogs, my brother and his gf Rachel have an adorable puppy with his own Instagram. Need some smiles? Follow Chewy the Aussie on Insta. I hope you'll be doing this regularly. So cute, simple and I love it. Any time I need a little mental break at work, I'll find a couple funny YouTube videos–it's always a good re-fresh (or puppy ones, obviously!). I belong in South Carolina! I matched with North Carolina! While I am a GA girl, I do love the Carolinas ;-) Love this post idea for Mondays too.